A pow wow is a meeting of Native Americans who celebrate the culture of their ancestors by singing, dancing and sharing a wonderful moment with other people. This kind of ceremony can last from one to four days. The term "pow wow" comes from the Algonquian word "pau wau", which means a spiritual ceremony. The current term – pow wow – is due to the arrival of white people who changed the spelling of the word to reflect their pronunciation of it. The proceedings of the celebration begin with the "Grand Entry". 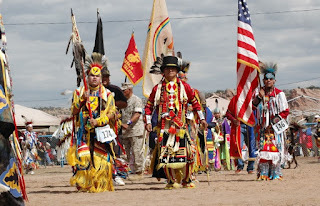 This step consists in the elders bringing different flags into the arena, amongst which the U.S flag, which is held in privileged position despite non-Native Americans’ bad treatment of Amerindians, as well as the Pow Flag and the Tribal Flag. The pow wow goes on with male dancers, followed by female dancers and children. Then, prayers are sung to honour the flags and the veterans. After this prayer, they gather together in a circle and they dance in a very dynamic way to the rhythm of the drum. Those two things - the circle and the drum - are significant. Firstly, according to Native Americans, life never ends; it is a continuation, a kind of circle. Secondly, the drum echoes the heartbeat of Mother Earth. As far as the music is concerned, singers are in the limelight. There are two types of singers: the Northern ones and the Southern ones. The Northern ones sing in a higher pitch than the others. Besides, music is the main feature of a pow wow. 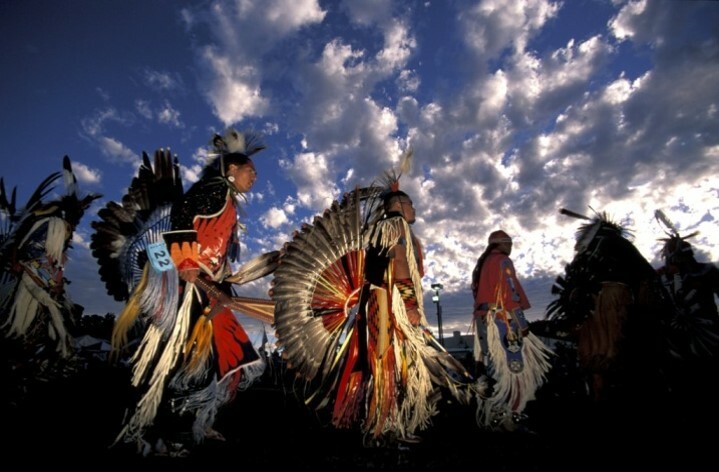 A pow wow is not only a cultural event, however: it is also a religious and spiritual ceremony. There are not only songs and dances. 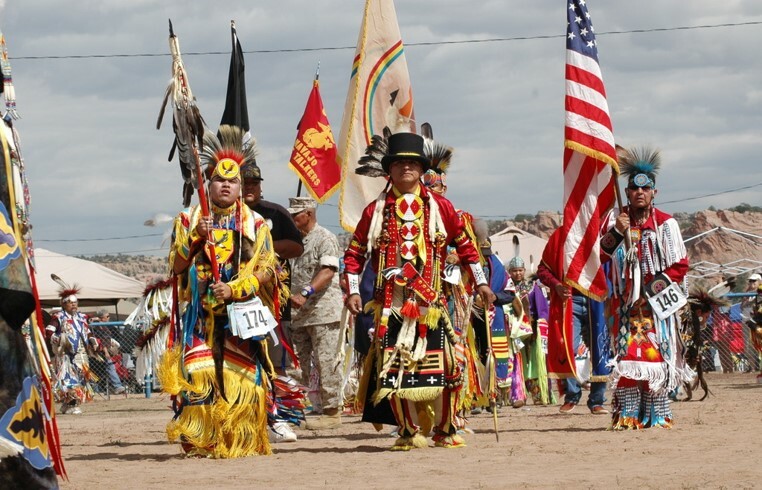 One of the main objectives of this kind of ceremony is to unite Indians, as in the past, non-Native Americans wanted to separate the Indian communities from each other. Moreover, it is an experience that you have to live at least once in your life. There, they meet other Indians but also non-Native Americans, they make new friends or see old acquaintances and above all, they pass down their heritage to the youth. Before World War II, pow wows were not as traditional as they are today. Little by little, they became more folkloric. Nowadays, pow wows can be divided into two categories: the competition ones and the traditional ones. The first ones deal with money: the winners of the competition leave with a quite significant sum of money. The second one is rather based on the fact that entertainers want to have a good time and enjoy the celebration, but the proceedings are the same in both. Despite the fact that everybody is meant to enjoy the ceremony, there are some strict rules that need to be respected. One of these rules is that you cannot interrupt a veteran when he is speaking. Ladies have to be well-dressed; revealing clothes are forbidden. Pictures are allowed on condition that the dancer has agreed to them. When there is a blanket dance, the public usually gives money, as a sign of respect. Finally, touching the dancer's regalia is forbidden. 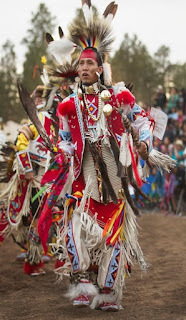 The regalia is a kind of outfit which is worn by the dancers. 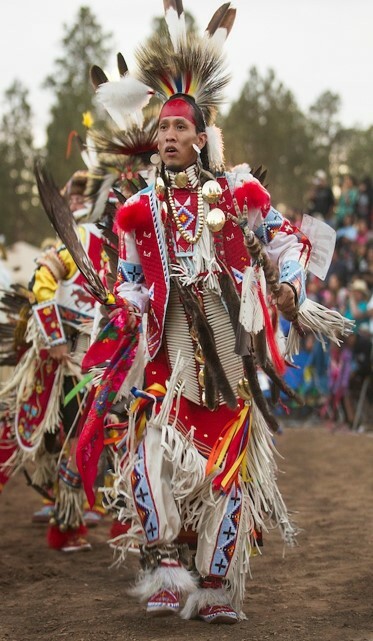 Each dancer has his/her own regalia. In conclusion, a pow wow is a cultural, spiritual and religious experience which aims to preserve the Native American heritage. If you want to see what a pow wow looks like, this video will help you to illustrate what has been told.